Lake Wabatongushi covers over 3,000 ha (10,000 acres), has 27 flowing rivers and streams, over 70 uninhabited islands, and numerous sand beaches. Besides excellent walleye and northern pike fishing there are ample opportunities to see numerous wildlife species such as moose, black bears, loons and bald eagles. Wabatongushi means “white sand” or “claws in the white sand” in Ojibway. Literally Lake Wabatongushi means “White Sand Lake”. Although most of the lake is rocky, there are a number of very nice beaches, with good swimming and the possibility of coming across an occasional arrowhead or artifact washed from the sand. 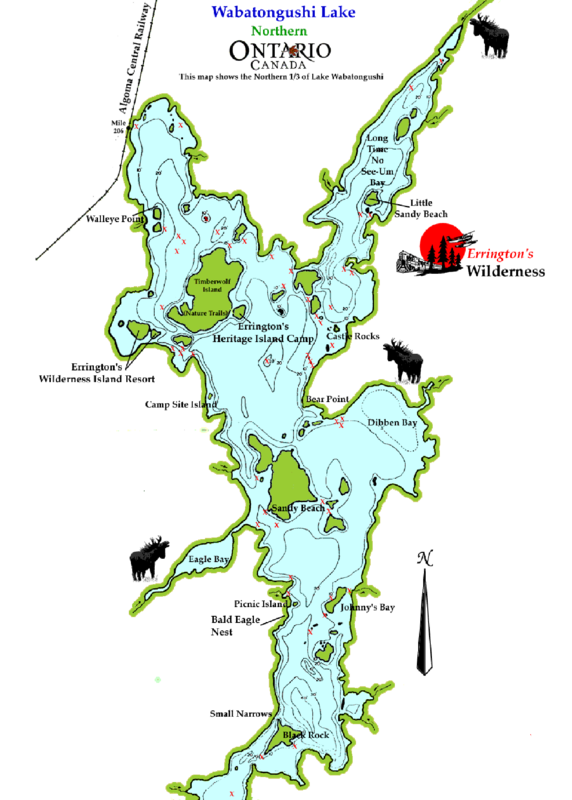 Lake Wabatongushi is completely inside the Chapleau Game Preserve, which covers over 3,000 square miles (7000 square km), and is considered the largest wildlife sanctuary in the world.